Cafe de Akbar01274 664005work Restaurant - IndianCafe de Akbar was originally opened to take in the overflow from the existing Akbar’s in Bradford and also as an unlicensed alternative to the main restaurant, no alcohol is served on the premises. We are focussing on a casual type of eaterie. We have a menu which offers the typical karahi-style dishes, along with items like quiche, grilled fish, pasta and so on, but with an Asian slant where we have some spicing in them. But what we also have are traditional English cakes, pastries and desserts. Dont Forget to ask about the specials! Our selection of set menus are designed to cater for parties of eight or more diners. 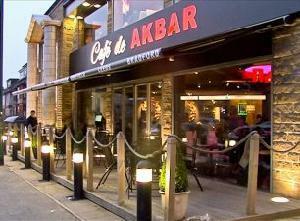 Cafe de Akbar was originally opened to take in the overflow from the existing Akbar’s in Bradford and also as an unlicensed alternative to the main restaurant, no alcohol is served on the premises. Located on Leeds Road (A647), on the edge of the city centre.